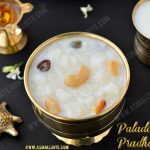 Today I am sharing the Onam special dessert Kerala Gothambu Payasam with step by step detailed pictures. 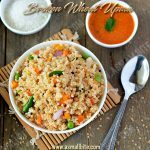 This broken wheat / cracked wheat / Dalia is very low in calories so helps in weight loss and loaded with nutrients. 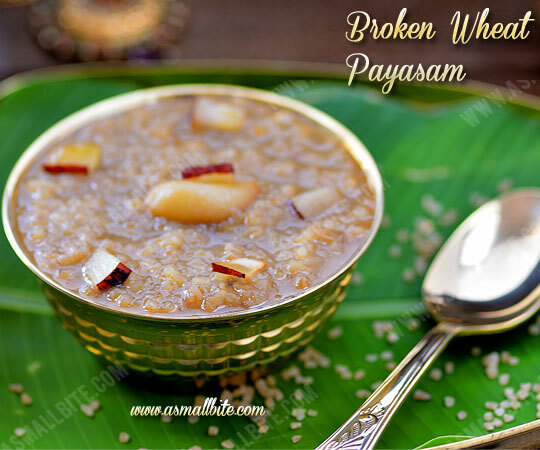 As series of festivals are coming one by one, this broken wheat payasam is truly a healthy indulgence, as we are using very less ghee and sugar free also. 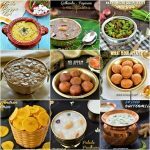 If interested check out my other onam recipes…. 2. 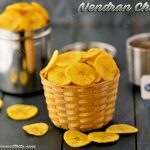 Chop coconut into small pieces and immerse jaggery in very little water. 3. Transfer the jaggery water to a pan, heat and melt it. Then keep by side. To a pan, add the broken wheat with little ghee. 4. Roast for 2 to 3 in low flame, till nice aroma wafts. Transfer the roasted broken wheat to a bowl and pour 3 cups of water. (This whole process can be in the pressure cooker itself). 5. Pressure cook for 3 to 4 whistles and fluff it up slightly with a ladle. 6. 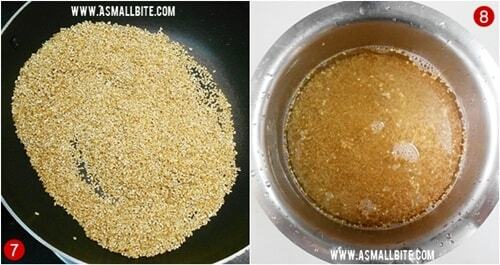 To a pan, add the cooked broken wheat and pour the melted jaggery water through a strainer. 7. Once it starts to boil, simmer the flame and pour milk. Don’t do it in high flame, as there is a chance for the milk to get curdled, when added to hot jaggery syrup. 8. 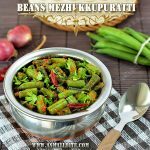 Cover and cook for 5 to 6 minutes, then pour coconut milk. After adding coconut milk, just give one boil. 9. Now add little ghee and cardamom powder. Switch off flame. 10. Fry the cashews and coconut bits in ghee and add it to the payasam. 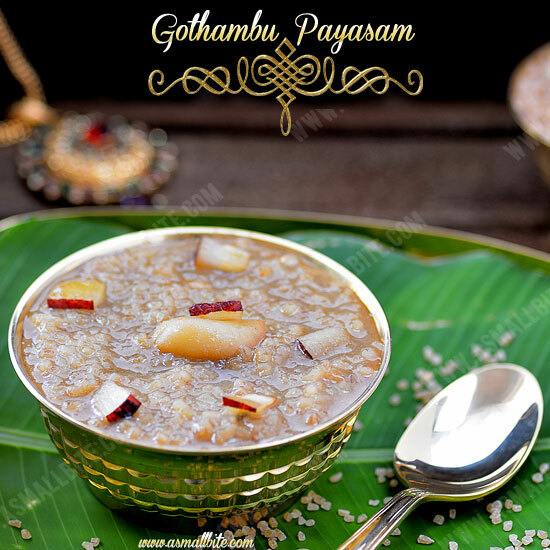 Try this Kerala Gothambu Payasam for this Onam festival. 1. Don’t cook the broken wheat till mushy, as we are again cooking in jaggery water and milk. If cooked fully, it becomes like a paste, also little wheat grains should be seen for nice look. 2. The colour of this kerala gothambu payasam depends on the variety of jaggery used. 3. Adjust jaggery quantity as per sweetness preferred. 4. 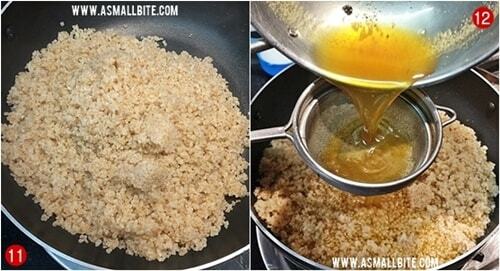 Ensure the broken wheat is cooked well before adding jaggery water, else it wont get cooked afterwards. 5. 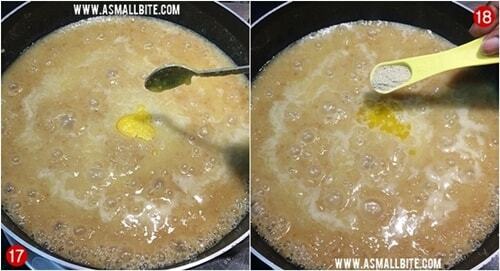 Simmer the flame fully while adding milk, as there is a chance of milk to get curdled when added to hot jaggery water. 6. 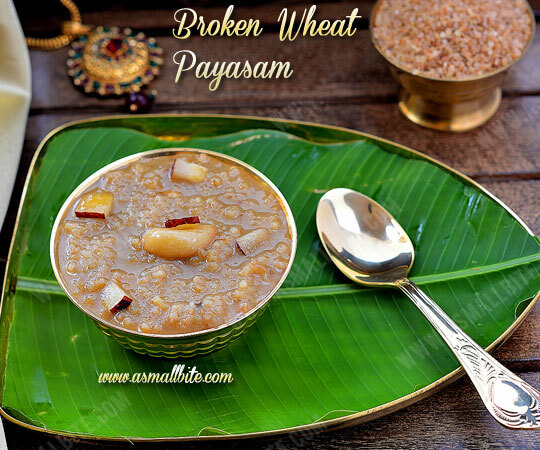 Addition of coconut milk is optional, but it lends nice aroma to the broken wheat payasam. 7. Also don’t boil the payasam for long time after adding coconut milk, else it gets curdled. 8. It thickens with time, just add little warm milk and adjust the consistency. 9. Broken wheat can be replaced with wheat rava also.